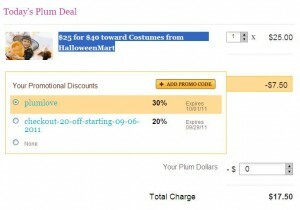 $17.50 for $40 Toward Costumes From HalloweenMart Through 9/29 | A Savings WOW! Halloween is just around the corner and from now through Thursday, September 29th, you can get a great savings on Halloween costumes from HalloweenMart through Plum District. – Sign up for your FREE Plum District account. – Under “Your Promotional Discounts” enter plumlove for an additional 30% off your purchase ($7.50 off) at checkout. Make sure to select that as the option you would like to use for your discount. – You’ll see the discount applied to your order. 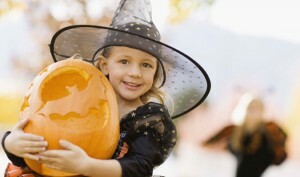 Buy your $40 worth of costumes from HalloweenMart for only $17.50 through Plum District today! Note: This post contains referral links. View our disclosure policy for more information.